A photon with energy greater than band gap energy of the semiconductor (Eg), is absorbed to generate and electron hole pair which results in electric current. Photo energy equals to hf where h is Planck’s constant (6.626*10^-34 Js) and f is frequency. If hf < Eg then absorption is zero. Optic fibre systems which operate at 1300-1600 nm thus use InGaAs. There is leakage current even when there is no light. It is called dark current. Photodetector has two parameters: quantum efficiency and responsivity. The wavelength if defined in nm. One way to increase quantum efficiency is to increase the width of depletion region. A lightly doped intrinsic semiconductor is placed between p-type and n-type semiconductor regions to create PIN photodiode. Generated electrons and holes are also referred to as photo carriers. In Avalanche Photodiode (APD) electric field is used to provide photo carriers with more kinetic energy. The electric field is created on edge of intrinsic region. Collisions between energetic carriers and crystal lattice result in electron holes. The free electron which creates the hole can cause more ionisation also known as impact ionisation thus leading to avalanche multiplication. 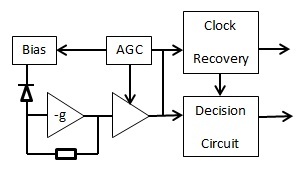 x is 0.3 to 0.5 for silicon APDs and 0.7 to 1 for germanium and InGaAs APDs. The frequency response of a photodiode is limited by photodiode capacitance and load resistance. The value capacitance increases with the size of active area and reverse bias voltage. The active area diameter of high speed photodiodes is 30 to 200 micro-meters. A photo detector can be sold with inbuilt preamplifier that is made from bipolar junction (BJT) or field effect transistors (FET).